An interactive online informational map showed voters in Seminole County, Florida, which projects would be funded using revenue from a proposed one-cent sales tax increase. 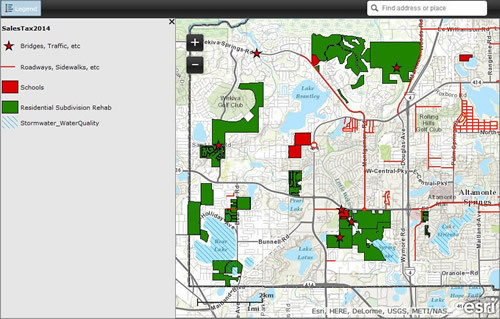 Seminole County GIS used ArcGIS Online and ArcGIS for Server to develop and deploy the map, which proved popular in the days leading up to a referendum on the tax hike. Read the article. Seminole County residents can click on the map to see where roads will be resurfaced or new school classrooms built. You've created a gallery of authoritative maps in ArcGIS Online and now want to share it on your website, blog, or other web page. You can embed your map gallery in minutes by following these easy steps. Read the tip. Dr. Este Geraghty is combining her passion for health and geography in her new role as the industry manager for Esri's health and human services team. Find out why she thinks place and health are inextricably linked. Read the article. Snowplow operations are much more efficient in Saginaw County, Michigan, thanks to an automatic vehicle location (AVL) system that uses Esri ArcGIS, GPS, and wireless technology to track the fleet. Read the article. Searching for a new site location or want to keep an eye on an area of interest? Two new apps in ArcGIS Marketplace may fit the bill. Read the article. Bank of America's Jonathan Voorhees talks about how GIS supports the bank's strategies to better serve customers. "Every single decision has a geographic element," he says. Watch the video. Captain Steven Pollackov of the New York City Fire Department talks about the potentially lifesaving information GIS provides to firefighters. Watch the video. You can see the latest information on fires in southeast Asia and other parts of the world mapped with Esri technology. Read more about the Global Forest Watch-Fires online platform and view the map. What are four building blocks needed to prepare for change such as shifts in temperature and frequent fires and storms? Access to great data is one. Read the blog from Esri's chief technology evangelist Bern Szukalski. Get a first look at the new Urban Observatory exhibit, scheduled to open next year at the Smithsonian Institution. Watch a Bloomberg Businessweek interview with Richard Saul Wurman, who conceived the idea of the Urban Observatory and works on the project with Esri and Radical Media. This Esri Story Map Journal traces outbreaks of the disease in Africa, beginning with the first known outbreak in 1976 in Democratic Republic of the Congo. Watch interactive mapping, data, and geofencing demos to see how the power of location will rock your apps. Learn more about ArcGIS for Developers. Esri offers several app templates that provide basic map viewing capabilities. One is Storytelling Basic. Another is Storytelling Text and Legend. 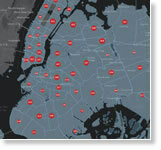 Find the ideal map viewer to suit your target audience. See your options. What can Esri's Find Hot Spots tool do for you? Watch the video. Esri hosts a free web course that introduces you to the 3D world of procedural modeling using Esri CityEngine. Contributing road data to Community Maps? Use this tool to convert road polyline features and attributes to the Community Maps model so Esri can use your roads in the World Topographic Basemap. Read the blog. Mainstream Renewable Power, headquartered in Dublin, Ireland, uses Esri ArcGIS to manage vast amounts of information related to wind and solar farm projects in Europe, North America, and Africa. Read the article. Want to add Tweets to your map? Here's how using two Esri templates. If you are thinking about Esri technical certification, take one of these free sample question courses. Esri intern Katherine Desy plans to take what she learned at the Esri User Conference back to school and, during her presentations, “blow people away with my interactive maps!" Read the blog. Esri is offering a free trial to ArcGIS 10.1.1 for Desktop Advanced with 10 extensions. Esri's education manager Joseph Kerski guides you through using new capabilities in ArcGIS Online to create and deliver a presentation. 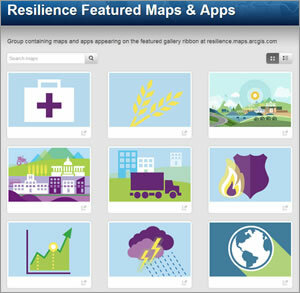 Congratulations to the winners of the Esri Climate Resilience App Challenge. The number of farmers' markets shot up by more than 6,000 venues in the last 20 years in the United States. Find those closest to you using this Esri Story Map. And read the article about the farmers' market phenomenon at Smithsonian.com. Esri's Allen Carroll interviews Robert Rose from the Wildlife Conservation Society about the problem of ivory poaching. Visit this Story Map Journal to see where elephants have been killed for their tusks and where the population of these animals has steeply declined.